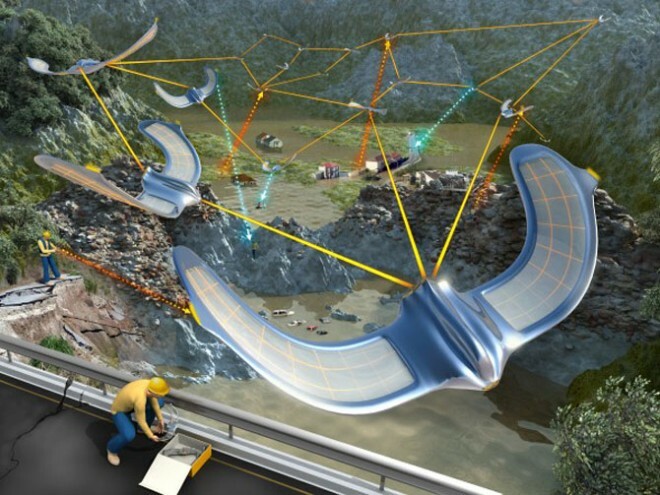 The Ecole Polytechnic Federale de Lausanne in Switzerland is developing swarms of flying robots that could be deployed in disaster areas to create communication networks for rescuers. The Swarming Micro Air Vehicle Network (SMAVNET) project comprises of robust, lightweight robots and software that allows the devices to wirelessly communicate with each other. The flying robots were built out of expanded polypropylene with a single motor at the rear and two elevons (control surfaces that enable steering). The robots are equipped with autopilot to control altitude, airspeed and turn rate. A micro-controller operates using three sensors — a gyroscope and two pressure sensors. The robots also have a GPS module to log flight journeys. The swarm controllers running Linux are connected to an off-the-shelf USB Wi-Fi dongle. The output of these (the desired turn rate, speed or altitude) is sent to the autopilot. For the swarming, robots react to wireless communication with either neighbouring robots or rescuers, rather than relying on GPS or other positioning sensors that might be unreliable, impractical or expensive. Software algorithms that know where other nearby bots are can stop them from crashing into each other. Designing swarm controllers is generally quite challenging because there is no clear relationship between the individual robot behaviour and the resultant behaviour of the whole swarm. The researchers therefore looked to biology for the answer. Army ants were used as inspiration for SMAVNET, since they lay and maintain pheromone paths leading from their nests to food sources. Similarly the flying robots are required to lay and maintain communications pathways between a base node and users in the environment. Robots can therefore be deployed as “Node MAVs” and “Ant MAVs”. The node MAVs spread out to create a grid onto which virtual pheromone can be deposited and detected through local communication. To maintain their position they turn on the spot describing a 10m radius circle. Ant MAVs then travel along said grid, communicating with the nodes as they travel along them to explore further air space. When the Ant MAV reaches a position in the grid that is not occupied, it becomes a Node MAV, thus extending the reach of the grid until connection with the target user in the environment is achieved.